Powers/Abilities: Superhuman speed and strength. Able to fly. History: (Mystic Comics #2-4, ga) Joel and Joshua Williams were brothers and scientists. The two doctors experimented for years, finally perfecting a robot made of rubber and filled with a secret gas, which they called Flexo. 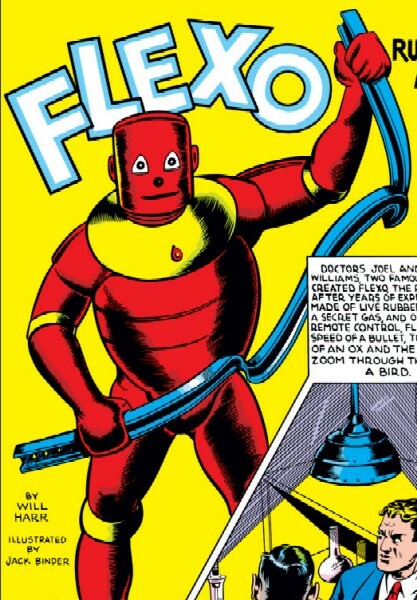 Directed by remote control, Flexo was employed by the men to fight crime. His first opponent was Dr.Murdo, a renegade scientist who had stolen radium and was using it to power a Death Ray. Comments: Created by Will Harr and Jack Binder.